Nothing is more flirtatious then a wink from an admirer. There is a bingo site that flirts with all your bingo passions and tantalizes players with a wink you won’t soon forget. Wink Bingo is the successful brand that has affectionately drawn in players to a haven of good fun. 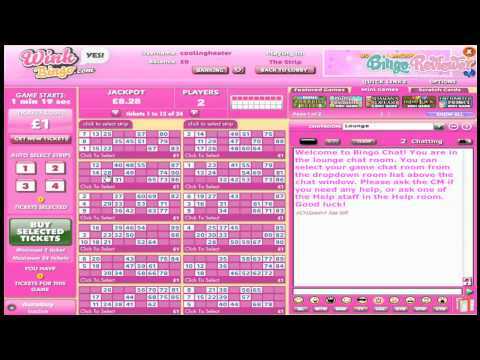 Wink Bingo is one of the best known bingo brands and has become hugely successful as a member of the Joy of Bingo Network. The site is jam packed with bingo, promotions and special games that are the envy of many other bingo sites. It's for these reasons, when combined with a solid platform of games and customer service that have made Wink Bingo one of the most popular bingo sites of all time. Dressed in a soft pallet of pinks and a touch of blue is a welcoming invitation to both male and female genders to come play and throw a wink out now and again to a huge bingo community. The pretty brunette mascot greets all newcomers with a wink and smile and sets the tone for flirtatious fun. Various Bingo games formats are available, the rooms are split between 90 ball and 75 ball rooms and 5 line Swedish bingo. Depending on your experience and the type of the games that you prefer you can choose from coverall and Progressive Jackpot games plus free games are played throughout the day in various rooms. The Moneyball Progressive Bingo game is played in the 75 ball Hangout room that is played 3 times every hour the day between 7pm and midnight. The Progressive is won when a bingo is claimed in 34 calls or less and will start at £250 and continue to climb all over again. Players also have a wide variety gaming options including Casino Games, Slots, Scratch Cards and Lotto adding winkable pleasure to your entertainment. Slots have enormous Jackpots that are famously popular with machines like Shopping Spree that is every girl’s dream who likes to shop until they drop! Why does Wink Bingo offer such a spectacular array of promotions? The answer is easy, it’s because they can and it is thanks to a heavy volume of players that have sky rocket them to online fame. What not a more fun way to welcome all new players than have a chance to spin! On top of your generous Welcome Deposit Bonus payers have a chance to spin the Wheel with up to £1,000 up for grabs absolutely Free. Since we are talking about Free it is the perfect time to mention the Free & Fun Bingo where there every Friday there is £500 up for grabs in the Risk Free Friday. Team Bingo is an awesome way to interact with your new bingo buddies at Wink where top teams share a prize package of 500,000 Joy Points. The Joy Gem VIP Club offers stupendous rewards to loyal players and the best part is once you have reached VIP status you hold that title across all Joy Bingo Network sites. Check out the 50 Shades of Wink where things are steaming up with hot Jackpots every Sunday from 6pm – 9pm. Play naughty games like I love 69, Top or Bottom, Spread the Love and Daz Lost his Speedos. These fun and flirty games take place every half hour. Always on top of their game Wink Bingo keeps a contemporary appeal drawing in a new breed of players without forgetting about the veterans of bingo. There ever evolving fresh approach to promotions and creative games is delightfully modern. We rate Wink Bingo with 4.75 Pink Hearts. Wink Bingo is really one of my favorites, and if you have to choose one site from among the many bingo sites we have, I would definitely choose them. I think they are perfect in everything, from the design to the prizes, to the games, promos and bonuses. It will be tough to beat Wink! I think that Wink Bingo has the best bonus scheme. I just signed up last week and got an additional £15 with absolute no deposit. You get 200% bonus on your first deposit and even with succeeding deposits, you get a bonus. They are really bent on giving away money on their site. I like the bingo games on wink, but I love their Roulette wheel and their scratch cards. So far, I've won around 200 quids on the site and I have been there for only a month or so. It's easy to see why people like Wink so much! Wink, in my opinion, offers the best progressive jackpot games of them all. It helps that they also have games that you can buy for 25p and win 2000 quids! Free games are what keeps me coming back to Wink. And they have lots of it! Even on Saturdays! Wink Bingo comes from good stock and what drew me in is the name and i am glad it did. Wink Bingo is a very friendly and welcoming site. They offer a 200% bingo bonus when you first deposit £5 - £100. All new members have the chance to Spin the Wheel and can win £15 - £1000. On top of that, for every £10 or more you deposit after that, you will receive a 50% bonus! New players are also welcomed into the wink family with 7 days of free bingo. Currently for January they are also having a half-price or less sale on bingo cards. At the top of their page you will find a calendar to click on and be taken to information about all of the day's specials and promos and schedules. This easy to use graphic looks like a day planner. Click on the different days and be amazed at all they have to offer you at Wink Bingo. As one of 7 Joy of Bingo sites, Wink Bingo has a special Fairy Joy Mother to look over it's loyal players. (Wink, wink, nudge, nudge!) Look for clues on the sites and on facebook so that you can locate your Fairy Joy Mother and be rewarded with lucky dust fun! At Wink, they really have all your favorites covered. They have everything from 75 and 90 Ball, to Swedish Bingo, which is always a nice addition. They have a fantastic Moneyball Progressive Jackpot that you always want to take advantage of. It keeps on growing until one lucky winner takes it home and then it will start all over again at £250! They also have guaranteed Bingo Jackpot games playing going on every day, week and month. A marvelous selection of Slots, Instant and Table Games are all up at the site for you to enjoy as well. Their free bingo is awesome as well. They offer it every single day and on top of that, great deals are running all the time, like tickets as little as 1p! They have awesome promotions on a regular basis with lots of money up for grabs. Besides the bingo, they have a really nice selection of other games as well, especially the slots! I initially joined this site because I had heard many good things about them. When I finally decided to join though, I was not too crazy about the welcome offer. It consists of making an initial deposit of £10 in order to receive any kind of offer. It is not a no deposit bonus. After making your deposit, they give you a 200% bonus and a spin on the wheel. This cheered me up a little. I love when sites give away free spins. It provides an element of anticipation before you even really start playing. As far as their bingo, they offer three types: 75 and 90 ball and then Swedish bingo. I found these to be great options! For me, the more you offer in terms of bingo, the more I like you. And, to me, this site has just the right amount. I was most excited about their promotions, though! They have a large selection of deals that are running each day and there is always a chance to win big. Maybe Wink Bingo does not sound like a well known site, but rest assured that they are among the best and I have run into many people with great experience on this site. The site looks modern, but I was not blown away to be honest. Either way, the site is very simple to navigate and it really makes me wonder why some others don't take it after Wink Bingo. You will need zero minutes to find everything that you need. I even tried their mobile site version, and all I can say is that they have done a fine job. You will be able to play your favorite games from wherever you are, providing that you have your smartphone or tablet, and the internet connection. First deposit will get you a 200% bonus and after you deposit your first £10, you get a free Spin the Wheel with a minimum of £15 guaranteed, and with prizes up to £1000. New players only. Deposit min £10 to get 200% bingo bonus + 200% games bonus (max £100 per bonus). To withdraw bingo bonus & related wins, wager 2x the amount of deposit + bonus funds. To withdraw games bonus & related wins, wager 50x the amount of bonus. Bonus wins capped at £100, exc. jp wins. Wagering requirements vary by game. Deposit balance can be withdrawn at any time. Withdrawal restrictions & Further T&Cs apply. 1000 Loyalty Points can be redeemed for £1 of bonus money.